Myopia (nearsightedness): Myopia is more commonly known as nearsightedness. Those who have this condition are typically able to see things that are close to them well, but cannot see things that are far away very well. It is caused by a change in the shape of the eyeball. It changes from round to a longer shape, or in more rare circumstances, the cornea is curved more than a normal amount. These changes affect a person’s sight by changing the way the light enters the cornea. It does not take the normal route, and ends up reaching the retina from the wrong angle, which blurs the image. Myopia most often begins in childhood, and a person’s prescription can continue to change for the worse throughout the years. This is especially true when the child is growing and changing a great deal, and often slows once he or she has reached their mature adult size. This issue can be confirmed by an optometrist during a thorough eye exam. After myopia has been determined, the patient will most likely need glasses or contacts in order to see well. He or she will also have to have another exam each year to ensure whether or not the prescription has changed. Some people will need to wear their glasses or contacts for everyday activities, while others may only need them during certain times, such as while driving or playing some sports. Hyperopia (farsightedness): Hyperopia, or farsightedness, is a condition in which one can see things far away, but is unable to see things that are close. It can cause problems such as headaches and eye pain and strain when reading. This vision problem comes about due to the eyeball being shorter than a “normal” eyeball, or by the cornea lacking a normal amount of curve. Because of this differently shaped eye, the light rays that would typically enter the cornea and go to the center of the retina instead hit behind the retina, causing the vision to be blurred. Hyperopia does not typically show up in a basic eye test, and must be determined by an optometrist or other eye specialist, through use of a test involving relaxing the eye muscles. The way to deal with farsightedness is often to get glasses for reading and other activities for which up close vision is needed. 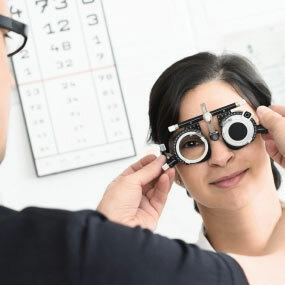 As with other vision problems, you will need to get eye exams on a regular basis in order to determine if the condition has worsened, or if you have any other issues that need to be addressed. Presbyopia: Presbyopia is often associated with aging. The symptoms include blurred vision and headaches when holding something near the eyes. This has less to do with vision loss and more to do with the inability of the eyes to focus due to loss of elasticity. Research shows that this is often due to the aging process, and occurs much in the same way as the skin gets looser and less elastic. Most people have already had presbyopia developing before they even realized, as vision problems begin later in the process. The part of the eye that is most affected is the crystalline lens, which loses flexibility as the eyes get older, and it therefore is unable to focus quickly between objects that are near and far away. Presbyopia is not an isolated occurrence – it happens to everyone at some point, usually beginning in their 40’s. The only way to determine for certain that your vision problems are due to presbyopia is to get a full eye exam from a qualified professional. The treatment would be to get glasses, most often only necessary for reading and other activities that require working with something up close. Those who wear contacts will still be able to do so, and although there are bifocal contacts available, many people opt to simply wear their contacts and use reading glasses as needed. Your prescription may need to be adjusted as time passes, so it is important to get regular checkups. Astigmatism: When you have astigmatism, you will likely notice that everything looks distorted or blurry, no matter how near or far away it is. You may suffer from headaches, eye pain, and other issues. The source of astigmatism is an unusual shape (oblong rather than round) to your cornea, which affects the way light rays enter your eyes. Astigmatism often goes along with nearsightedness or farsightedness. It can range in severity, depending on the degree of distortion of the cornea. It is believed that a person with astigmatism may have it from the time he or she is born, and it may not change throughout his or her life. An optometrist can determine if there is astigmatism through a thorough exam. In some cases of astigmatism, no action needs to be taken, as the vision is not affected enough to warrant a need for correction. In worse cases, when the patient is suffering from vision troubles, headaches, etc., prescription glasses or contacts will probably be needed. Double vision: Also known as diplopia, double vision is exactly what the name suggests. The sufferer sees two of what he or she looks at. The cause for double vision is that both eyes are looking in different directions. Normally, both eyes focus on one point and the image is sent to the brain, where it is processed as one. The reason behind the eyes looking different directions can be one of two things – either the muscles that control the eyes’ movements or the muscles in the brain and nerves that control the eyes are not functioning properly. This may be due to cataracts, refractive defects, and other issues. The brain’s natural reaction to double vision is usually to block out one of the eye’s input to the brain. This results in impaired vision, obviously, and if left untreated, it may cause further vision problems. To treat double vision, optometrists will usually recommend doing certain eye exercises or maybe even surgery. In some cases, a patient will need both. Cataracts: Many people develop cataracts, usually after they are 55 or older, but they can occur in anyone. This is a condition that involves the clouding of the eye’s crystalline lens. There are many symptoms that can indicate cataracts, such as blurry vision, double vision, loss of ability to see colors, a period during which it is easier to see without glasses, worsening nearsightedness, being more sensitive to glare, etc. The eye will begin to appear milky and cloudy. Cataracts can come about due to age, but there are other risk factors as well, such as UV exposure and cigarette smoking. If a person develops cataracts, it is usually in both eyes. They can take years or maybe only months to form. The only way to get rid of the cataracts is through surgery. After cataract removal, vision will be greatly improved, so much so that many people no longer need corrective eyewear. However, many people do still need contact lenses or glasses afterward. Spots & Floaters: Many people experience visual disturbances that are like light spots, threads or specks. They may be barely noticeable, or they may grow to the point of obstructing vision a great deal. For the most part, these spots are not indicative of a greater issue, but there are times that they may be a symptom of bigger health problems. For instance, sometimes tears in the retina can cause the visual disturbances, and must be treated before the situation worsens. To be on the safe side, it is usually a good idea to get a thorough eye examination, including dilation of the pupils. This will help the optician to determine the source of the spots and how to treat them. Often they are not a serious problem, but there are cases when laser treatment or surgery may be necessary. Conical Cornea (Keratoconus): Young adults sometimes may develop a rare condition in which the cornea thins out and becomes distorted in shape. This will change the vision, but it cannot be corrected by wearing glasses. The most common treatment is for the patient to wear hard contacts, otherwise known as rigid gas permeable lenses. These will smooth the shape of the cornea, unlike soft lenses, which would simply conform to the irregular shape of the cornea, and therefore would not be effective. There may come a time when the rigid lenses are no longer effective, and in that case, a corneal replacement surgery may be needed. It is generally a fairly simple procedure that almost always heeds desired results.